In addition to the free 2-day shipping and the absence of any tax, all activation fees related to establishing a new account are waived. The promos expire November 22nd, 2010, so you only have 3 days to take the plunge. Again, a new Verizon 2-year agreement is required to qualify for the special pricing. 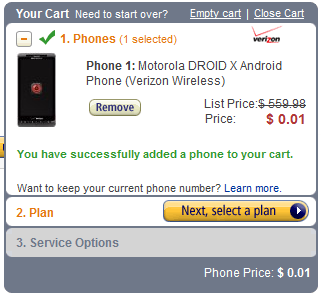 Friday, November 19, 2010, through Monday, November 22, 2010, save on all DROID phones starting at a penny from Verizon when you purchase them from AmazonWireless.com. Plus purchase a new Verizon device and receive an activation-fee credit for up to $35 for each qualifying line of service activated on a new 2-year individual or family plan account purchased from AmazonWireless.com between 12 midnight PDT on November 19, 2010, and 11:59 p.m. PDT November 29, 2010. This offer is sponsored by Verizon and is valid only in the United States. Activation-fee credit will appear on your bill and may take up to several billing cycles to appear. Standard early-termination fee and other one-time and monthly charges and fees may apply. Not finding what you're looking for? 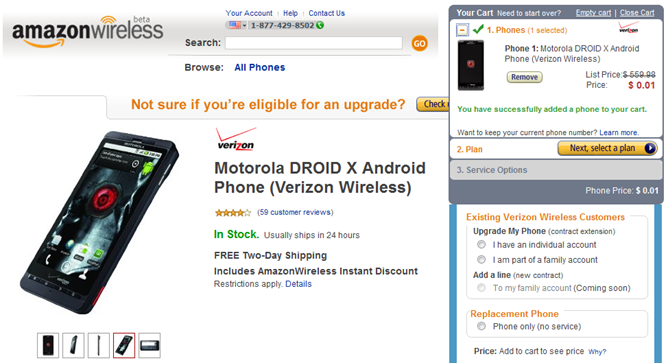 See our full selection of Verizon phones with service available at AmazonWireless.